Drummer and composer Davu Seru, one of two dozen musicians who played as part of last weekend’s Celebrating Henry: A Threadgill Festival, reflects on the experience. I remember the Challenger explosion better than I do the dismantling of the Berlin Wall. In fact, I remember Gorbachev’s birthmark better than I remember the dismantling of the wall. There is a hole in my memory, and I sincerely hope that it is because saturation makes it difficult to recall experience verbatim. Blackness must know itself in order to wear the capital “B” without the effect of unwitting self-parody. Knowing oneself means that you can move through the world like a hero destined to suffer but also to eventually hit pay dirt. But it takes time to make dirt, and the culture revolutionaries are dying fast. Their model is fundamental to how Gen X, my generation, would break from the pattern of soul decay that Cold War America used to engineer those little boxes away from the city and a war in Vietnam. And so punk rock, hip hop, and popular culture emerges from the unprofessionals before being co-opted by financially hip captains of culture who would give it back to them on ’80s television. A movie star president acting as a moral authority to the hard-life Black gens. Arts foundations and police double their impact. 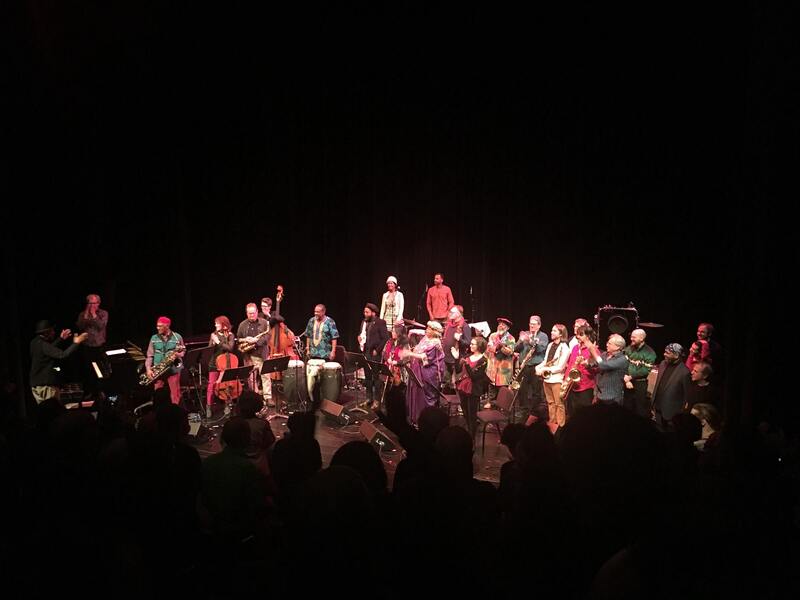 Once word had gotten around town that cellist Michelle Kinney would curate a Henry Threadgill festival at the Walker Art Center and that resident musicians would be involved, I got on the phone and invited myself to the party. As gatekeepers ex officio, we talked about who else “should” be involved, weary all the while of leaving people out. Artists who reside in Minnesota but claim the world as home often complain about how we are treated by other Minnesotans. In fact, some of us complain so loudly that at times we are granted favor, only to be left with the burden of not spoiling it. But how do you know who to invite to the Henry Threadgill festival? Would you know them by their record collections? As a peer of Henry’s? By their proximity to the Association for the Advancement of Creative Musicians (AACM)? By past ties to New York City? I rehearsed and performed with three ensembles: Charcoal, featuring Milo Fine and Anthony Cox; a band called Charles Avenue Congress, co-led by my Saint Paul neighbor, saxophonist Nathan Hanson, and featuring vocalist Mankwe Ndosi, violinist Laura Harada and pianist Joe Strachan; and, lastly, I would also perform as part of the large chorale of players during the night’s finale. Initially, there was uncertainty as to how exactly to go about representing ourselves as the “impacted” or “inspired.” Does it mean playing the composer’s previously published work? Writing new material “in the style of”? Self-importantly presenting our idiosyncrasies as the mysterious-but-manifest result of a Henry epoch? 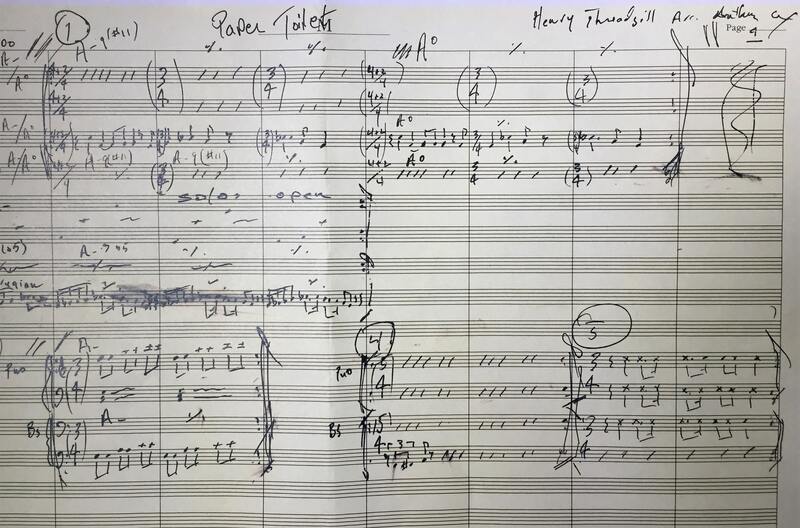 My groups settled on interpreting transcriptions of “Apricots on Their Wings,” “Hope a Hope a,” “Paper Toilet,” and “Bermuda Blues.” Which is to say we chose songs that would give occasion to an impromptu ensemble finding its way to what is most Threadgill about itself. One thing we knew is that Henry did not want to be bored and that—almost in order to insure as much—he would be present for the multiple sound checks/dress rehearsals that immediately preceded the Friday evening concert. So, properly spoiled by our patron Walker staff, and following a day of laughter, joy, and the pride of knowing our worth, we took our place that night. You ask a composer what their favorite color is, and after three words you’re left to think about Van Gogh, Kandinsky, and Mondrian. What do Piet Mondrian and a farmer in northwest Iowa share in common? A family resemblance, plasticity. But God’s anger given over to pure Cartesian form—a new art which expresses through abstraction, a drama reduced to a language-game like Odysseus signifying at Polyphemus. Like “jazz,” “yellow,” “snowflake,” and “zooid.” The stride in a young Thelonious Monk and boogie woogie-less Dutch Calvinism: neither compliments the other, though they are wholly dependent. Black soldiers during World War I brought some things to Europe that would grow to a dance. Europe hears black music and experiences color and non-color as rhythmically the style of the city. Small pulses, subdivisions. Density and verticality boroughed. An enthused Piet Mondrian would design a paranoid theosophy, self-consciously aware of the taboo of idol representations. Non-colors (the sullied) and colors (the pure) together determine the marvelous noise of rhythm. A mystical and elusive logic of code, movement, pattern. A built environment composing directions through the city; a flaneur on his mapquest to Penelope through the din of the vernacular. By the looks of it, you might assume that Mondrian painted works like Broadway Boogie Woogie (1942–1943) and Victory Boogie Woogie (1942–1944) straight from the tube. By the looks of it, it looks like jazz. Something exotic, less the funk. Essential but forgotten, if ever understood. God’s law for today. Nope. Most of what you see on stage is a mix of page and person. Hear motifs placed just out of reach. The Stubblefield-Starks shuffle calling us out to move. Returns which are difficult to prepare for and sublime. Surplus: more music than the slate can carry. And everyday passions ambiguate within a spectacle to honor the master. Ways of knowing and the division in languages; the break, the play, the language-game: that’s what we sat for on Saturday night. An incentive to our being asked to celebrate him. On this side of the wall from Henry Threadgill, Zooid and the Pulitzer Prize. To which we might add: marvelous like a bunch of resident artists of the Twin Cities music community being invited, supported, and affirmed as far more than “local.” Invited as artists who understand their work in a global manner. The local show, the local bin, the local items on the menu be damned. I think I was invited to participate as a drummer, composer, improviser, and artist who takes himself and others seriously. Imagine upwards of 24 musician, many of whom work together, many who don’t; many who have shared a community long enough to have accumulated prejudices and pettinesses; many too inexperienced to know why they should not be satisfied; some grappling with the memory of having been, over the years, burnt by institutions like the Walker as well as burnt by musicians who swoop into town to dole out coastal pity to the provinces… imagine them all as talented, serious and not too serious people who have made a life of the art that many experience only at a distance. Imagine them as children who believe in superheroes. Lovers who believe in gods.